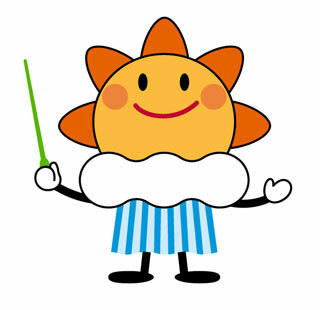 JMA's mascot is named Harerun (in the hope of hare, the Japanese word for “fine weather”), and is designed with elements of sun, cloud and rainfall. Harerun holds a green baton in prayer for a disaster-free, peaceful world. The mascot helps to raise public awareness of meteorological services as well as natural disasters and global environmental issues at various events held at the Meteorological Museum and local offices.